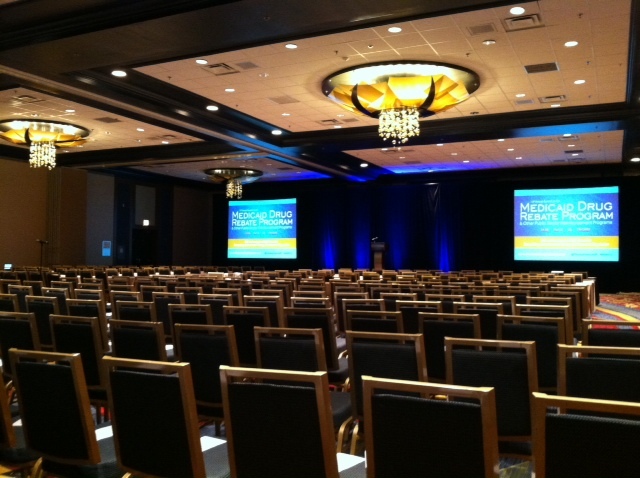 Edward McAdam, Daiichi Sankyo kicked off opening remarks for day 2 of MDRP 2013, leading us into our morning Keynotes. The first Keynote: Healthcare Policy into 2014 - Medicaid's Downstream Effect on a Financially Struggling United States Government lead by Michael Steele, former Chairman of the Republican National Commitee and Poly Analyst at MSNBC was our first session of the day. Steele asked questions such as, "What are our priorities as a nation?" and reminding the audience to think about what it is you do in the context of a service provider, and service given. Steele also touched on the future of problem solving, or rather, the problem solvers, millennials, describing their dependency on apps, but also their ability to create new ones to solve problems. Steele's overall message was that you're going to have to adapt to create a new environment, while still dealing with the same old issues, especially with our healthcare system changing so drastically. He closed with asking the audience, how are you going to fit into the future? Steele reminded them that it doesn't matter if you like the ACA or not, it's here, and it's happening. The old rules no longer apply, so you must adapt to the new ones, create new conversations, because our decisions will become the strategic links as to how we solve problems in the future. Commander Krista Pedley, Director at the Office of Pharmacy Affairs, kicked off the next session, Annual Update on 340B Program Regulations, Processes and Enforcement Answers from PHS. Pedley discusssed the components that make up the HRSA audits of entities, including volume of purchase, length of program, and targeting entities. She also touched on the process of audit results, noting that entities have opportunity for notice and hearing, and once agreed, the final report is posted to the website. Another topic Pedley covered was the purpose of annual recertification, which is required by statute to ensure program intergrity, compliance, transparencey, and accountability. Perhaps one of the biggest benefits from the resertification is the accuracy of covered entity information for 340B data bases that it produces. The last issue Pedley addressed was the 340B user fee, although some people may not necessarily agree with it, but it's the only way the program can continue to improve and evolve, without the fee there would be no resources for the program. Our next session, Taxpayer Dollars and Corresponding Oversight Requirements, lead by Alice Valder Curran, Partner at Hogan Lovells LLP, discussed the '340B Program Reconsidered'. She answered the question, program savings or program profit? Stating that program savings is really program profit, if 340B were restricted, manufacturers would get more money. And in terms of protecting the taxpayer- which one are we protecting? 340B saves taxpayers money, aren’t manufacturers taxpayers too? It’s not a question of we are better at where we are, its that we're nowhere near where we need to be. Should 340B discounts be viewed as taxpayer dollars? And if not, why not? Another topic that Curran covered was entity recertification, more importantly, changing how it's determined. Also asking, should covered entities have any accountability for how they use 2 billion dollars a year? She also discussed the fact that covered entities face extremely limited penalties in terms of interest and exclusion from programs. Currans bottom line? Stop complaining and start looking into your liabitlity. Start overseeing your exposure to the 340B program, analyze your 340B book of business and gross-to-net impact. GTN has suffered from 'benign neglect' for far too long, and it's time to take a closer look. Also, do your homework now, know the issues important to your company, the mega-rule will be your chance to ensure your concerns are addressed regarding compliance and operational issues. So keep an eye on the legislation this fall and be prepared! Kathleen Peterson, Special Counsel at Cooley LLP, finished up our morning session with AMPs, NARPs, NADACs and FULs Oh My! Peterson discussed the outcome of the proposed rule. If finalized, it would replace each professional dispensing fee with actual acquisition cost plus professional dispensing fee. Historically, the dispense fee for Medicaid has been primarily low, this would increase the fee substantially. Peterson also discussed the impact of marketplace changes on rebate payments. In closing, she advised to learn from your past, and always evaluate possible legal issues. Stay tuned for coverage from our afternoon track sessions!